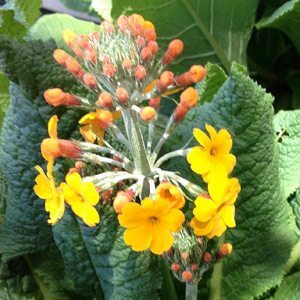 The tall growing Primula bulleyana with its bright golden yellow flowers is hardy plant for a part shaded position with some morning sun or ‘dappled light’ areas. It does require moisture year round, but not waterlogged soils. This is a species from China where it grows at altitudes of around 2000m, however given cool moist shade it works well in many gardens. Reaching around .5m in height this is a semi evergreen perennial species and in warmer climates it prefers a part shaded position. The candelabra type flowers are held above the foliage. This species has been in cultivation for over 100 years. Primula bulleyana is a little later to flower than many other species, it is easy care as long as a moist position with good drainage is provided. Dig in some well rotted compost and a little coco peat to help hold moisture. Water new plants in well with a little seaweed fertilizer, some additional compost and an all purpose fertilizer in late winter will be adequate. Propagation is from seed or by division of established clumps. Seed is sown on the surface and needs to be kept moist and warm for 1 month and then given a cool winter. Primula bulleyana is also suited to growing in containers given appropriate conditions. Height – Can reach to 60cm in height. Aspect – Morning sun, afternoon, light shade. Soil – Humus rich moist well drained.